Some things really have to be seen to be believed. When I first heard that TokyoToys had got artist Terratag to design a mecha-version of their mascot Coco, I was expecting a Kubrick-type design. The actual result is far better then I could have imagined. Terratag is known for using Gundams and the TokyoToys mascot Coco is known for his cuteness and likeness of Banana flavoured Pocky. How could these two possibly be combined? Simple, just stick Coco's head straight onto a Gundam! This approach not only delivers an hilarious image as the design is strong enough to surpass the initial comedy value. Terratag's striking use of colour and bold design still make this a cool t-shirt and the use of a dull grey background make the main image all the more striking. It does not stop there though. The image also contains some cool Japanese lettering and the TokyoToys logo on the chest and wing of the Gundam, as well as a crest being added to Coco's head for affect. 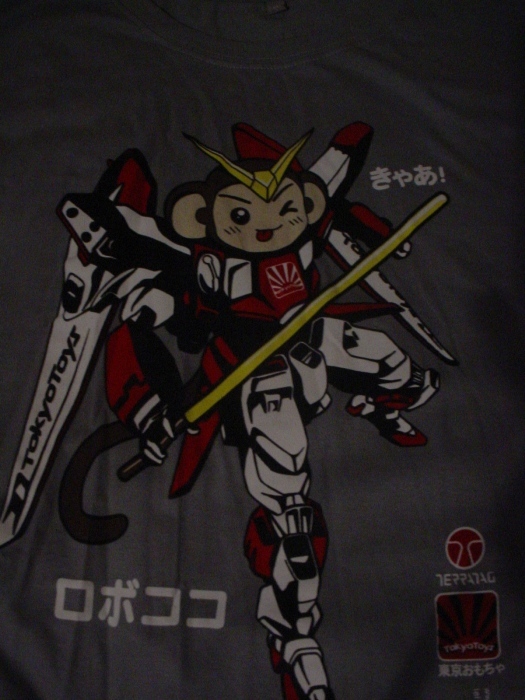 What I didn't notice straight away though is that the MechaCoco is wielding a stick of Banana Pocky! Combined with the winking Coco sticking out his tongue this sums up how fun this t-shirt is! Now for the serious stuff. The t-shirt is 100% cotton and the quality is worth the sticker price. Now that is out of the way I say this is a t-shirt anyone with a sense of humour should own. Although this was only available at the recent MCM London Expo there is always the possibility it could be available at the next one. Given the popularity surrounding the TokyoToys stand and their Expo exclusives, more fun products such as this are a certainty but can they top this t-shirt? I'll be at the next Expo to find out!